RIPTA’s Gold Line Trolley, now Route 6, starts providing direct service to Roger Williams Park Zoo starting tomorrow. Trolleys depart Kennedy Plaza approximately every half hour 7 days a week with runs to the Zoo starting at 8:30am. The last return Trolley from the Zoo is 4:16pm weekdays and 4:28pm on the weekends. A full service schedule is available here [.pdf]. Trolleys run from Kennedy Plaza down Washington Street, to the Service Roads, to Prairie Avenue making a diversion to CCRI and the Met School, meet Broad Street and head through the park to the Zoo (some trips make a diversion to Colony House on Niagara Street). The trip from Kennedy Plaza to the Zoo takes approximately 25 minutes. Save $1.00 off your admission to the Roger Williams Park Zoo with a RIPTA Rider Receipt! Valid April 16, 2011 – September 5, 2011. After boarding the bus, simply ask the driver for a Rider Receipt. Show the receipt when purchasing your zoo admission. 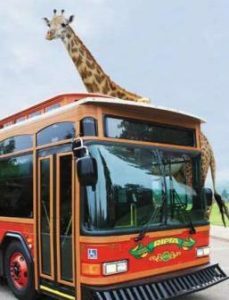 If anyone rides the Trolley to the Zoo over the coming weeks, let us know how it was. Get your shovel, Angel! That would win some points in my book. I saw a Route 6 bus on Broad Street, then a Route 6 Trolley on Washington Street with “Zoo” as a destination. Trolley running now? Or wrong destination sign on the trolley? Dunno. maybe they were just practicing the route tonight.